- VESA Hole Pattern: 75 x 75 mm & 100 x 100 mm. - Distance from wall: the monitor's rear cover will be 5.25" from the wall. This is a commercial grade articulating LCD wall mount bracket. 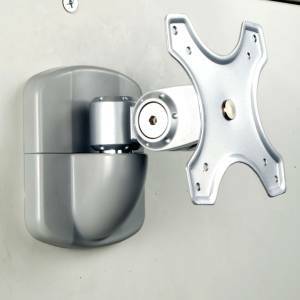 It includes the VESA screws to mount the monitor, the wall anchors for concrete walls (for hollow wall, use the appropriate anchors), a bubble level for straight installation and an Allen wrench for torque adjustment. The torque ("stiffness") of the articulations can be easily adjusted with the provided wrench, to achieve the desired ease of movement when adjusting the viewing angle. Both articulations can be adjusted.